LAS VEGAS—Aspiring gourmets may wish for the fancy equipment needed to perfect many dishes, but such gear can be expensive or difficult to use. 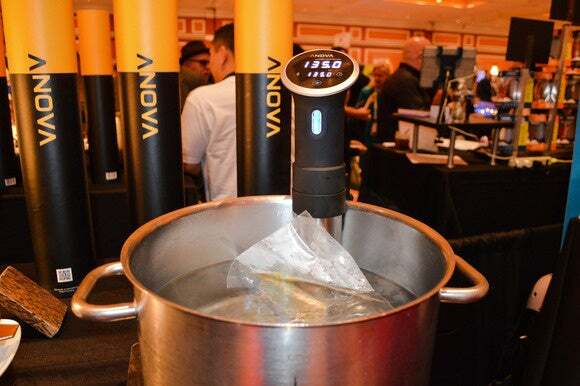 Anova’s sous-vide Precision Cooker is neither of those things, however, and that’s why it’s such a hit: This $179 Bluetooth-controlled gadget is simple to operate and requires nothing more than a pot, a plug, and a plastic bag. First, a little background: Sous-vide is the French art of cooking food in a vacuum-sealed plastic bag, in a water bath, at a low, precise temperature, for a long period of time (often 96 hours or more). Food comes out juicy, evenly cooked, and infused with flavor. But sous-vide cooking is no easy feat for the home cook, because it requires an ultra-controlled environment. You can’t just stick a bag of food in a pot of water on the stove for a long time and hope the temperature of the water won’t deviate at all (it will). That’s where the Anova Precision Cooker comes in. This gadget, which looks sort of like a hand mixer, heats and circulates the water in your pan, maintaining the temperature perfectly. The best part is that the Precision Cooker can be used with any pan, on any surface (no stove necessary), and you can use any kind of plastic, sealable bag. Update: Now you can read our hands-on review. The Precision Cooker isn’t battery-powered, but it does connect to your smartphone via Bluetooth. The Anova app (iOS, Android to come) lets you adjust the cooker’s temperature, and you can also push recipes to the cooker from Anova’s library of sous-vide recipes. This summer, Anova plans to launch a Wi-Fi-enabled version, which will let you control the device remotely.